Owl painting. British Wildlife Watercolours of woodland animals and birds. 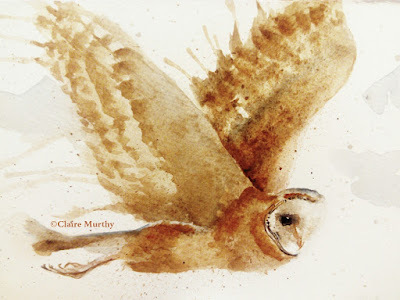 The barn owl's heart-shaped white face and dark eyes gives it a place in children's fiction and related magical tales; with its gold and silver jewel-peppered feathers and ghostly face, it has an air of mystery about it that is perfectly captured in the fluidity and translucency of watercolours. This watercolour sketch was painted to capture the owl's solitude in its search of food.